Cook noodles in boiling salted water according to package directions. Drain, and rinse under cold running water. Purée peanut butter, vinegar, agave nectar, ginger, soy sauce, garlic, lime juice, lime zest, and ¼ cup cilantro in blender or food processor until smooth and creamy, adding 2 to 3 Tbs. warm water to thin, if necessary. 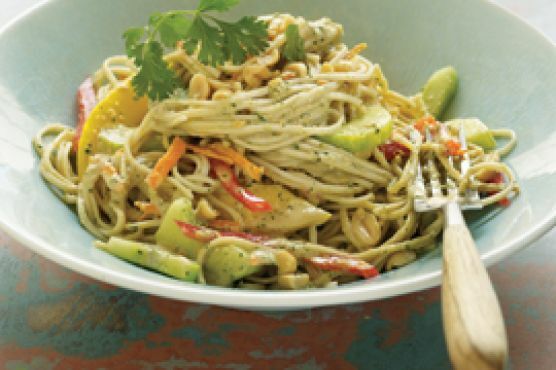 Toss together noodles, cucumber, bell pepper, carrot, and peanut butter mixture. Garnish with remaining cilantro and chopped peanuts, if using.